So, I've always been a little torn on these covers. They are really eye-catching, and I love how much they stand out from other fantasy novels. I like the consistency of the face and an object, as well as the different color for each book. However, I adore the UK covers of this series. They have only a beautiful representation of an object on each without the random face, and that makes me so much happier. I would pick up the books immediately if I saw those covers in store! To be completely honest, I was a little put off by the summary for the first book. They sounded so strange and unlike anything I'd ever read before! I'm still pretty new to fantasy, but even these sounded a little out there for me. Winged strangers, human teeth, otherwordly war, monsters, mysterious errands... I mean, what? But there was also a promise of star-crossed love, and that captured my attention. This book really is strange and otherworldly, but it's also brilliantly imagined and gorgeously depicted. You'll get to read about the battle between good and evil seen through the eyes of a girl who discovers just how powerful she is and how hope, and the courage to see it through, can change everything. A smart, courageous and admirable heroine. A gorgeous, powerful and kind hero. A battle that takes you into other worlds that you could only dream of discovering. A world filled with people who are fighting someone else's battle for dominance. A dark, mysterious magic that upsets the world's delicate balance. A seemingly hopeless situation, the fear of the unknown and the power of believing the impossible. A fearsome group of monsters and their fiery adversaries who each swear never to surrender. An impossible, star-crossed story of love, destiny and hope. Reactions to the final book has been a bit mixed. The writing and characters remain true to the first two books, and the story is resolved a way that I, personally, found very satisfying. However, some new threads are introduced that are integral to the story, and they throw off the pacing a bit. If you loved the first two books, you'll probably still really enjoy the final book in the series. You may have a few complaints about the conclusion, but you won't regret taking this incredible journey with these memorable characters! Oh my goodness, I absolutely recommend this series! I am still pretty new to fantasy, but I wouldn't hesitate to recommend these books to so many readers. With evocative writing, a richly imagined world and epic characters, there's so much to fall in love with in these pages. Seriously, I can't even do Taylor's writing justice - it's so gorgeous! Be prepared to lose yourself in this world and fall head over heels in love with these characters as the battle between good and evil divides friends and foes. These sound so good! 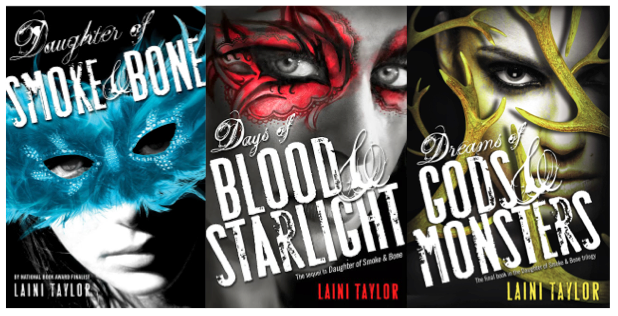 Now that all three are published, I think I might give this series a try -- I've just gotten so burnt out on the waiting for sequels -- at first dying for the next installment and then slowly forgetting what happened and why I was so eager as the wait lengthens! So I'm trying not to start new ones that are only part way through at least until I clear some unread series off my shelves. You've actually read this series before me! I definitely intend to read the series this year (actually, I'm reading it in June), mostly because I've heard awesome things about it, it's a fantasy series AND it's completed already. I'm really excited because everyone says the writing is beautiful, and I do love that in a book! Plus, it definitely sounds different. So glad you liked this one! Unlike you, I was sold on reading this series after that description of the first book. I read a lot of fantasies and it is a very different sort of story than most being told, which made it more exciting to me. Anyway, I agree with basically all you said here. It's a wonderful series. I wasn't a huge fan of the final installment, but it's still better than so many other fantasy series getting published. And for not being a big fantasy fan, haven't the last two series you've discussed for this feature been fantasies? That makes me happy to see you enjoying fantasy series, Hannah! The last time you did this feature you made me read Fire and Thorns, which we both know was THE BEST THING EVER. It must be fate that this time, you are talking about the next series Alexa and I are planning on reading together, because I'M SO EXCITED RIGHT NOW. I trust your opinion, and especially because you mentioned that the synopsis always sounded strange to you (yes!). Can't wait!! !